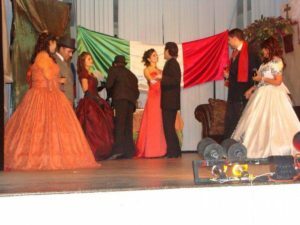 “Indigo” is a story in which discrimination and racism are exposed towards different ethnic groups during the year 1845, when Mexico still claImed the land known as California. 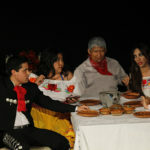 Purpose: We presented this production four times in two consecutive years with the aim of raising funds for the Catholic organization “Encuentros de Promoción Juvenil” (EPJ). 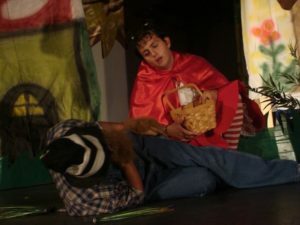 “Erase Una Vez” is a satire of Little Red Riding Hood that mocks with the Mexican double entendre way of speaking. It’s about a “manly” little girl, Cape, on her way to her Grandmother’s house, but is more concerned in finding—true love? No, finding a man to feed her desires, and with the help of her cricket friend, Cric, they encounter chaos in the woods. Purpose: “Erase Una Vez” was strictly produced to mock the comedy Mexican’s are known for; double entendre. This served as way to entertain our audience, but also distribute how a comedic Mexican language. 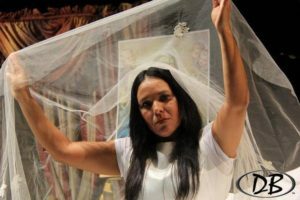 “La Esposa Que Nunca Fue” touches the issues of psychological disorders such as bipolar disorder and schizophrenia through the story of Olga Soledad. Purpose: This theatrical performance aims to raise awareness on mental health disorders and bullying. “Abuso” is a story that revolves in an apartment complex, where various families are involved in a series of domestic violence events. Characters slowly intertwine with each other’s stories, creating more chaos into their lives. 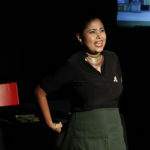 Purpose: “Abuso” is a theatrical play we produced to educate the viewers about domestic violence; the original play even has its own musical theme (of the same name). 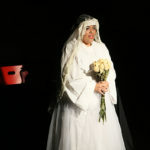 “Doña Barbara” is an adaptation of the Venezuelan novel by Rómulo Gallegos. The main character of this production portraits a strong female character. 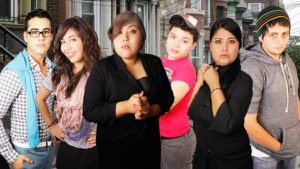 Purpose: The purpose of this production is to promote Hispanic writers. 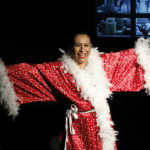 “Estigma Seropositivo” tells the story of a successful writer, Laura Flores, who was brave to speak out about her struggles living with HIV. Purpose: This theatrical performance educates the community and combats the stigma and discrimination surrounding people diagnosed with HIV. 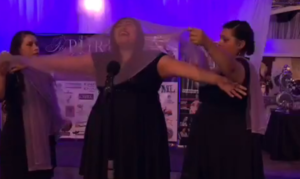 “Prejuicio” depicts the modern-day prejudice and discrimination towards the LGBT community. 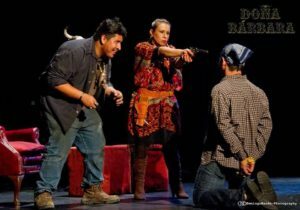 The characters in this play suffer as a result of social norms that force them into the shadows in a world full of lies. Purpose: This theatrical performance wishes to empower the LGBT community to seek acceptance and promoted respect among the diverse society. Rosa is a middle-aged woman, and breast cancer survivor; she is a singer, trying to write a song with a strong message to help other women check themselves before it’s too late. Purpose: Breast Cancer Awareness was the main purpose to write this play and present it for free for the community. 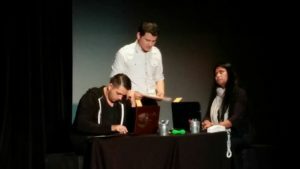 “Calavera con Calavera” invites the public to learn the history of the Burgos family during the night they reunite to celebrate Día de Los Muertos. Mystery ensues when the famous Catrina begins to appear, and secrets are unraveled, leaving the audience guessing who is dead or alive. 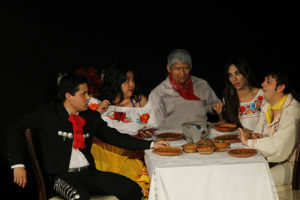 Purpose: The way the play was developed was to educate at the same time; it shares the symbolism and traditions that revolve around the traditional Mexican celebration of Day of the Dead. We have also created a Children’s version we have presented in Schools, and Día de Muertos Festivals. 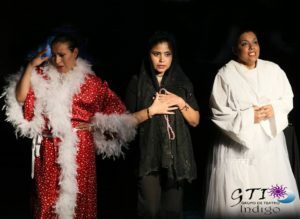 “Tres Mujeres Tres Historias” is an anthology of three different stories told in monologues; Rosa, a musician who is a cancer survivor, Olga, a deranged woman who lost her mind due to love, and an overrated actress in distress. Purpose: To promote women empowerment in the arts, by representing strong characters that deal will an emotional coaster ride, and creating awareness in Cancer and Bullying. 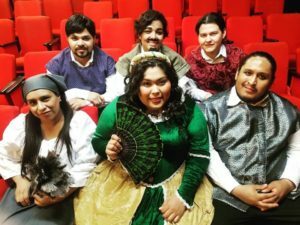 Purpose: The idea of honoring Cervantes was to show the new generations about this iconic writer of his work far beyond Don Quixote. Purpose: To create awareness against domestic violence. 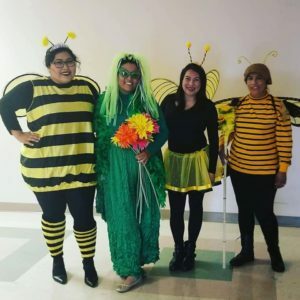 “Jita La Abejita” is a children’s play about a lazy bee who is given an ultimatum to work, or be kicked out of the hive, and faces a dangerous snake. Purpose: We wanted to educate children that lying can get you into trouble, and sometimes in danger, while at the same time that work is important to survive.